Here are some pictures of the trees that we will be using in the 2016 Guest Artist Series Morning Workshop with Rodney Clemons. Rodney will be picking one of these trees to use for the Friday night demonstration as well. 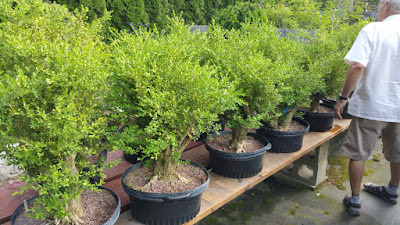 The trunks on these Korean Boxwoods are nice and thick - ranging from 3.5 to over 5 inches in diameter. Kind of hard to tell, but for size comparison, my fingertips are close to touching the trunk in this picture. I wish I had a ruler with me that day.